Planning parties might sound fun, but it takes more than booking a caterer and DJ to make a living at it. It also requires diplomacy, salesmanship, multitasking, and above all, a desire to help other people enjoy themselves. Party planner engagements can range from weddings and product launches to corporate seminars and awards dinners. 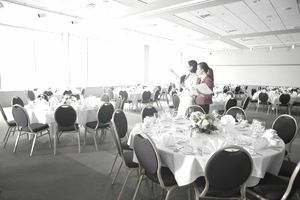 Tasks can include renting a hall, mailing out engraved invitations, coming up with a theme, booking entertainment, deciding on the food and hiring waitstaff. The median income for event planners is over $61,000 according to Salary.com, with the range being from $52,901 to $72,329 per year. There is no specific education or training required to become a party or event planner, but experience can go a long way in helping you know what to do and what to expect. Further, having a network of professionals from caterers to entertainers will be important in having the resources to supply what clients want for their party or event. Long or odd work hours. Party planners need to be on-hand during the event, which often runs evenings or weekends. Some may be multi-day events. Every event can be stressful as you only are as good and popular as your last party. If you've never planned a party or organized an event, volunteer to do one to make sure you have the stamina and interest in event planning as a business. Write a business plan outlining your service, prices and financial projections. This is the time to decide if you're going to focus on a specific type of events, such as weddings or conferences. Determine what and how you're going to charge for your services. Keep in mind your clientele and the event. Weddings and large corporate events have high expectations and lots of work, whereas an office party usually has less. Obtain needed business license and liability insurance. Create your marketing plan and promotional materials, such as business cards, brochures, and a website. Determine your ideal market and how you'll reach it to get clients. Consider including videos of successful parties, with your clients' permission, of course. Gather images and testimonials of your events to create a portfolio of your success. Also, develop a plan for generating referrals. Develop a network of reliable suppliers and professionals needed to help you pull off your events, such as florists, caterers, photographers, and DJs. Get active in your community, especially with your local chamber of commerce and other business-to-business networking. Not only can you generate business from these events, but also, cultivate referrals. If you have trouble getting your business off the ground or want more experience before going on your own, consider getting an event planning job.